“I still missed 17 shots. I tricked off a 50-piece. I felt like I had some shots that I wish I could have made last game and this game,” Durant said. Durant became the seventh player in Warriors history to post consecutive 40-point games — along with Rick Barry, Wilt Chamberlain, Curry, Antawn Jamison, Purvis Short and Thompson, according to Elias. Golden State closed the third on a 12-2 run to pull within 83-79 heading into the final 12 minutes. Mo Bamba’s 3 with 10:35 to go gave the Magic an 88-79 lead before Thompson answered from deep the next two possessions. Quinn Cook, starting in place of Curry, contributed eight points, six rebounds and four assists as Golden State concluded a four-game homestand by beating the Magic for the 11th straight time — the Warriors’ second-longest active streak against an opponent after 16 wins in a row against Phoenix. Curry scrimmaged Monday and is scheduled to go through a full practice Tuesday, making it possible he could play Thursday at Toronto. “He might,” coach Steve Kerr said. Magic: Aaron Gordon began 0 for 6 then left in the third with lower back tightness and didn’t return. … The Magic are 2-2 on the road vs. the West. … Orlando hasn’t beaten the Warriors since Dec. 14, 2012, and not in Oakland since Dec. 3 that same year. Warriors: Durant is 29 of 30 from the free throw line the past two games. “I’m trying to stay over 90 this year. Hopefully my 3-point percentage comes up, too.”… Golden State is 7-1 against the Eastern Conference this season. … The Warriors won their sixth straight at home vs. Orlando. … Green was limited to conditioning work Monday and rode the bike. He needs to be on the court a couple of times before Kerr is ready to put him back in a game. … Key reserve Alfonzo McKinnie was sidelined a sixth consecutive game. 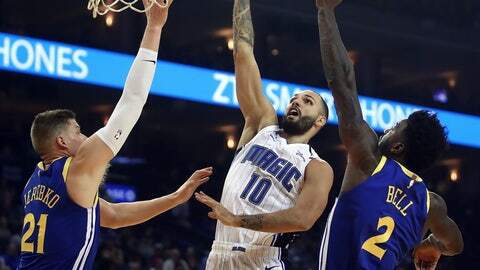 Magic: Continue their West Coast swing at Portland on Wednesday. Warriors: At Raptors on Thursday trying for a ninth straight victory in the series and fifth in a row in Toronto.